This year's L. Welch Pogue Award will be presented to Paul Mifsud. 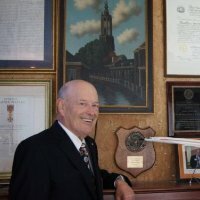 The International Aviation Club of Washington, DC and Aviation Week & Space Technology jointly announced that renowned international aviation attorney and strategist Paul V. Mifsud is this year’s recipient of the prestigious L. Welch Pogue Lifetime Achievement Award. Mifsud is now principal at Mifsud CrossMedia Communications, and continues to run MIFNET, which is a daily, email-based international aviation forum widely used by aviation professionals and academia around the world to discuss and debate international aviation policy and law. Mifsud’s distinguished career as an aviation attorney, air political strategist, and government affairs expert included posts as General Counsel USA for KLM Royal Dutch Airlines from 1976 to 1994 and KLM VP, Government & Legal Affairs USA from 1994 to 2010. He was involved in obtaining approval for KLM’s groundbreaking alliance with Northwest Airlines, which ultimately led to the branded global airline alliance structure that dominates international aviation today, and he was a key leader in the development of the European Union-United States Open Skies agreement that liberalized the transatlantic market. For that work, the Queen of the Netherlands bestowed on him the Order Oranj-Nassau (Officer). "Paul has been instrumental in getting Open Skies literally off the ground, made it possible for airline alliances to exist, and then single-handedly created the MIFNET forum that continues to exist to this day. International Aviation owes Paul Mifsud a debt of gratitude on many fronts,"
- Aviation Week President, Greg Hamilton. Aviation Week created the L. Welch Pogue Award in 1994. Checks should be sent to the address provided below. Credit card payments can be processed through Paypal once registered. Guest names for name tags, recommendations to the Club for government invitees and other questions should be directed to Natalie Peterson at (202) 663-8051, or via email, at: natalie.peterson@pillsburylaw.com.